Paul has been busy this year again with Quality in Careers work, leading the full alignment of the national assessment criteria with the Gatsby Benchmarks. 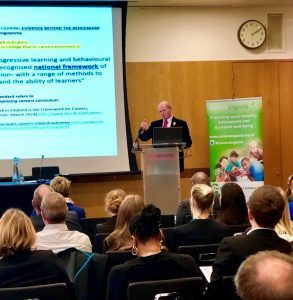 On 13.11.18 he spoke about this ground-breaking development at the Westminster Briefing/Careers England CEG Summit in London (see the photo below). Paul’s also been actively supporting Axia Digital as its Company Secretary & Non-Executive Director. Commitments at the Dales School as Chairman of Governors have continued, and Paul has had increased numbers of services to lead as Licensed Lay Minister in the Benefice of the Lower Swale as the number of Ministers in the team has dropped from 5 to 1 in the past 18 months. It’s been a while since we updated our news: so this is a more detailed update than usual. 2017 saw Quality in Careers become the single national CEIAG Quality Award with the previous 12 award providers becoming Licensed Awarding Bodies for Quality in Careers – a transition which took much of Paul’s time. Paul continued his occasional national public speaking on Quality in Careers throughout 2017; his final 2 events that year being with Westminster Briefing and with Understanding Modern Gov. 2018 began with Paul heavily involved in proposals to realign the national assessment and accreditation criteria for Quality in Careers even more closely with the Gatsby Benchmarks for “Good Career Guidance” – as we write this is on-going with major consultations at present with Licensed Awarding Bodies, the Careers & Enterprise Company, and the Gatsby Foundation. Paul spoke on Quality in Careers at the NAHT annual conference for Special School leaders in Stoke on Trent at the beginning of March – where his added familiarisation with SEND issues from his Chairmanship of the Dales School Governing Body was crucial. During 2018, Paul will be involved in a number of Relicensing Panels for current Awarding Bodies for Quality in Careers, and some further speaking engagements. In addition to continuing to be Company Secretary for Axia Digital, Paul has also been appointed as a non-executive director on their Board. Paul continues in his role as Chairman of the Governing Body for the Dales School again this year; and has increased his Lay Ministerial commitment to the Benefice of the Lower Swale in the light of the Ministerial team reducing in number. Alison no longer undertakes matrix assessment work; her contributions to Boundary Partnership are now limited to admin matters – after her long professional career in the field, she has ‘retired’ from onsite work. Alison is now concentrating on managing her MS and keeping active mentally as well as physically where she can. This includes regular seated Zumba, RDA and MS exercise classes – and she’s now actively enjoying participating in Rock Choir. During the second half of 2016 Paul’s major commitment has been completing further national revalidations of CEIAG Quality Awards and promoting Quality in Careers nationally, including maintaining the interest and support of the DfE. Alison has just completed a further matrix Standard assessment in south-east Northumberland. Paul has been reappointed to provide (on a supply for services contract) Company Secretarial services for Citizen Connect Ltd trading as Axia Digital (Batley-based). In addition to completing a number of annual ‘continuous improvement checks’ on organisations holding the Standard, Alison has recently undertaken an assessment of an FE College in the NE of England (it’s first accreditation). Paul worked with David Andrews to prepare a history of England’s CEIAG QAs and the national validation through QiCS. It was published by the Quality in Careers Consortium in April 2016. 6 of England’s CEIAG Quality Awards achieved national revalidation this spring (February-May 2016). Acting as Director for QiCS, Paul chaired the 6 panels. It is with true pleasure that we can announce this Award. and Chair of Governors, The Dales School. For services to Career Education and Guidance.